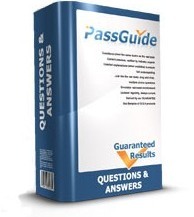 The PassGuide Testing Engine is the world's top exam distribution system, designed to deliver you authentic practice questions paired with challenging and accurate answers. There is literally no other system like it! The PassGuide method gives you more than the correct answers - it brings you clear and practical explanations to cement your exam preparation. Regular and frequent product updates - Always have the latest practice questions! You will pass your actual exam - GUARANTEED! 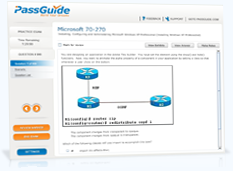 You are in complete control of your practice testing experience. Set the duration of Practice and Virtual tests, assign a passing score percentage, and select the questions - and even the order of the questions AND answers! 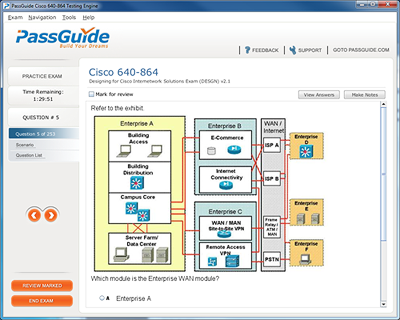 This is YOUR test, and PassGuide gives you all the tools you need to pass your real exam. Put an end to answering and re-answering question you have a firm grasp of - fiolter your delivered questions by topic, exam sets, or even by question type! 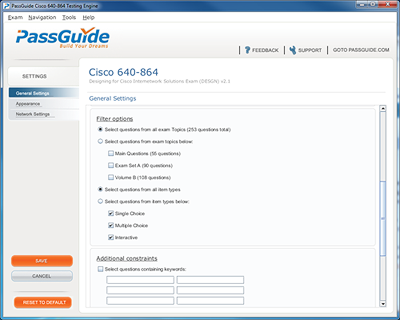 Choose to only answer questions with single answers, multiple choice, or interactive answer such as drag an drop. Not enough control of your questions? How about select only questions containing certain keywords? Drill down to the core of the actual exams and focus with laser-like precision on the areas you need help in the most. Stop any repetiition what-so-ever by selecting to answer question that have not been answered yet, that you have never answered correctly, or you can even limit the number of times you receive a particular question. Practice exams are broken into groups of questions. You select which questions you will answer from the groups. You will see a break down of the kinds of questions, and how many exist in each category when your Testing Engine loads. Find this list under Exam Topics any time you want to segment your training into a broader scope of questions, but keeping a focus on primary exam goals. Review any or all of your questions and answers before and after submitting for your score. 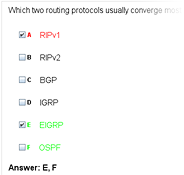 Quickly see the questions summary, your selected answer(s) and whether it was marked for review. When examining results after an exam, you can even see which ones were answered correctly, or incorrectly from the Question List. Marking your questions for review allows you to highlight questions you may want to revisit before submitting for final score. You can also flag questions for any purpose, such as continued studying or for review. This is an excellent too when taking the Practice Exam with as an open book test. Understand your results quickly with basic color coded review. Incorrect answers display in red, with correct answers to all questions in green. In Practice Exam mode, choose whether to display this information after answering a question, along with explanation of the correct answers, or upon final review after your test has completed. The Testing Engine retains your Exam History so you can view your progress with each test or re-testing attempt, as well as review any and all questions in each of your previous exams.